Pumapampa is a wide plain at an elevation of approx. 4200 m asl., embedded in the southern part of the Cordillera Blanca where - in contrast to the northern part of the mountain range - mainly metamorphic and sedimentary rocks are exposed. The area today occupied by a wetland with crysal clear ponds most likely represents a former lake basin. The wetland forms kind of an oasis within the puna vegetation dominating the area with its tussock grasses (Stipa ichu) and dwarf shrubs. However, the clear ponds are not the only reason why all the tourist buses stop here on their way up to Glaciar Pastoruri: the puna landscape of the surrounding slopes is topped by the towering - though often already dead - inflorescences of Puya raimondii, a very special plant which is much more popular among foreign tourists than among the local inhabitants. Puya raimondii, a giant rosette plant, is the largest terrestrial bromeliad species in the world. The above-surface part of the plant consists of a bowl-shaped lower part and a columnar inflorescence without branching that can grow up to 25 m and needs more than one year to fully develop. The inflorescence and the more than 8,000 yellow-green blossoms appear only once in the Puya's lifetime at an age of usually approx. 40 years. After flowering the Puya spreads its 6.5 million seeds and later slowly dies off. The remains of the Puya raimondii can be seen in the landscape for a long time. 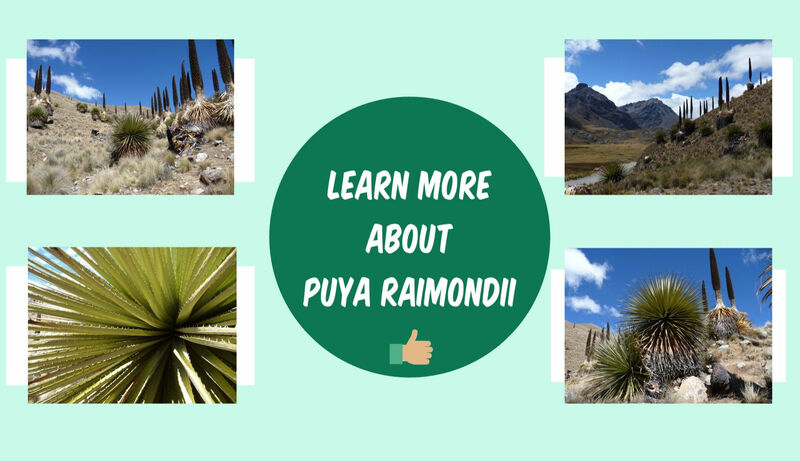 Click into the graphics to learn more about Puya raimondii.